One of the biggest misconceptions about landscape lighting is that it disappears in the Winter. Quite the contrary – it actually just changes. As it does in Spring, Summer and Fall. Lighting is a four month display that highlights different aspects of your property with each interval of the year. Spring offers a fresh, new look with beautiful blooming flowers, vibrant colours and a reset of all things growing. Lighting showcases these features with an effective glow. As trees fill out lighting will highlight their foliage. Summer is a time to enjoy the patio, a campfire or just a nap in the hammock. 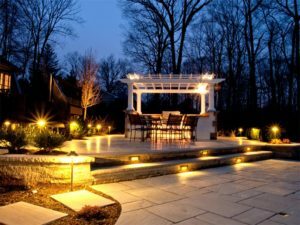 Your landscape lighting system will draw you back to the yard after dark to extend your outdoor enjoyment. Friday and Saturday nights in the summer never looked so good! Fall brings about a new set of colours. Yellow, orange and red tones are set-off by warm, welcoming light. As the days get shorter, your landscape will come alive earlier in the evening hours. Soaking up the last barbeque or glass of wine never felt better with fall lighting. In the Winter, there is good reason to use a variety of effects such as down-lighting, moonlighting and path lighting. The reflection from snow coupled with these features brings new life to the landscape despite the cold temperatures. Bare trees take on an elegant silhouette appearance unlike any of the other seasons. Lighting brings a glow to those long winter nights. 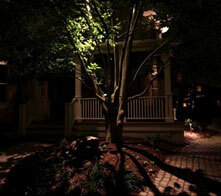 No matter the season, landscape lighting gives your property a great nighttime look. Call us today to start your four seasons of light! This entry was posted in Landscape Lighting and tagged landscape lighting fall, landscape lighting spring, landscape lighting summer, landscape lighting winter, lighting on September 15, 2017 by moonglow.